I have had the MX Sport for 6 months and it has become my preferred detector. I have the 13 and 7 inch Detech coils along with the stock coil. This machine covers all the bases extremely well. Depth is on par or better than other brands top machines. I am finding it very easy to learn and work with which is a bonus for new users. I have almost 40 years experience with detectors so I know a great machine when I see one. The 13 inch coil grabs the deep signals and the 7 inch is a tank in trashy areas. I started with a White's and I have always had at least one White's detector to play with - currently I have three. The MX Sport is very close to my TDI pulse detector in most situations. The preset modes make it a great turn on and go machine and there is plenty of tuning options for pros to get what they need out this machine. With a number of new top end machines hitting the market you should do your homework on the MX Sport. This is a machine many users will be sorry to have overlooked. I have had a great experience with the MX sport. I have found droves of copper in Michigan, all the way to civil war mini balls, and a descent amount of gold and silver. Just in one week in copper country I found 20 lbs of copper, one being a nice solid 10 lb mass. It get great battery life and gets great detection depth, and most of all. It is an reliable IRON workhorse. The people over at Whites really gave an effort to make an all around detector and got it right. I've had mine for almost a year and it finds things that my DFX, XLT, even the Deus has missed. It's waterproof down to 10 feet. The display is huge and bright. It comes with an extra wire to use your own set of headphones if you don't want to wear out the waterproof headphones. The only thing I've seen people have problems with were the headphones there plastic and if you toss them around they'll break but whites will replace them. Great job Whites! The MX Sport had a rough and embarrassing rollout, but finally we have a machine worthy of the White's brand. It is now the AT Pro killer it was meant to be. From its aesthetics to its ability, this machine is top notch. If you want an all terrain machine that has depth on par with the very best out there, this is for you. If you already have the AT Pro and are underwhelmed with its depth, this is for you. My only problem with it and with any newer releases is water machines should be multifrequency. There's no reason to be releasing water machines without this ability, particularly if you're targeting Beach hunters. It will do fine on the beach and in the surf, but it will not shine there like the CTX-3030, or CZ-21 will. If you're a fresh water hunter like me though, the MX Sport is just what the doctor ordered. I'm very impressed at how hard this machine will hit on deep targets. It runs very hot. I would compare it to my F75 LTD in Hunting ability. In terms of durability I'm giving it 4 stars because I don't like how Whites connects any of their machines to the coil. Where their shaft meets the coil is too flimsy and wobbly. A machine should be able to stand upright on its own. For Ease of use, any machine that has competent turn on and go features deserves 5 stars, however, ease of use should not be the end game. The MX Sport can get as complicated as you want and I like that. My depth entry is for actual in-ground detection. The machine air tests further than 12" on a quarter. As I say, it's as deep as any of the top shelf machines out there, and better in some cases. One advantage to a single frequency machine is that all its power is behind one frequency signal, rather than split or divided among many like the FBS machines. First let me tell you a little about me. I have been Metal detecting for 40 years. I have saw a lot of metal detectors come and go and have tried most of them. 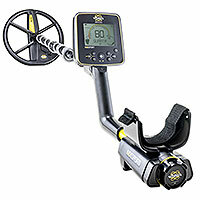 The MX Sport is a top notch metal detector. The sport ID's well gets great depth and is water proof. The sport has a very fast reset and works well in all the sites I hunt. This has been my go to detector for the last couple of months even though I have metal detects costing twice as much. The sport is easy to use and will not leave anything in the ground that other detector's would find. I have the stock coil and the 7 inch Whites Detech coils. Both coils work well here in central PA. The sport is hard to beat and built like a tank. I highly recommend trying the Mx Sport if you are looking for a new detector.